Everything Italian is what you will find at Buon Italia inside Chelsea Market. 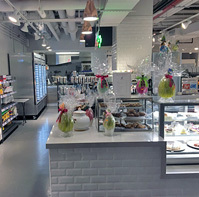 Locate in the lower level, called Chelsea Local, shoppers can find everything from fresh pastas, seafood and truffles to housewares and baking essentials. Visitors to the market can also grab a bite from the shop's pasta bar as well as Italian-style sandwiches.